I know it’s some time ago now, & it certainly feels like it, but I thought that for this post I’ll write about how it’s been at the market last Winter. Although… well, in short, I can simply put it down to one word: ‘crap’. The weather during the week leading up to it was not good for starters. 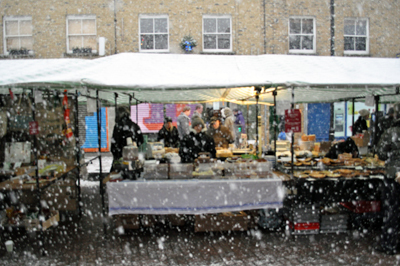 It first snowed on the Wednesday I think, & I remember at that point I deliberated on wether to turn up at the market. But my books showed that I ALWAYS do ‘more than a good-day’ around this time of the year, afterall it’s meant to be THE cushiest day of the year for retailers, & I thought snow or not, surely people still need cakes for dinner parties & chocolate boxes for presents…, right? 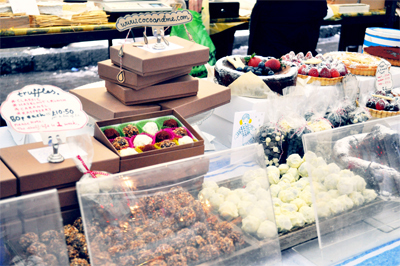 So I decided to go, but chocolates-wise made just 360 truffles, which is slightly more than the usual but a lot lot less than last years’ 700+. Waking up to snow-wonderland on Friday morning was, let’s just say an official booking for the doom & gloom ride for Saturday. At this point, I made an executive decision (ahem!) to bake as little as possible – so there were no lemon drizzle cakes, cheese cakes, brownies & lemon tarts, & generally less of everything else, especially small heart tarts. First thing when I woke up on Saturday morning, I looked out of the window. Good, it’s not snowing. Hm, it might be alright. So I psyched myself “Right! I’m gonna do this! Let’s do it, let’s do it, let’s do it!! !” & got in to my battle-gear (Lol!) of heat-tech, turtle-neck, fleece jumper, multiple layers of leggings, woolly socks, & the ‘pièce de résistance’ stick-on heat pads… – D was really great about all of this snowy situation & without a single moan carried everything in to the car & scraped the snow off the car windows. But as we tried to set off, the engine… wouldn’t start up. “Crap…” (I very very rarely swear, but on this occasion I was). On reflection, this perhaps was the tell tell sign of things to come that day. Miraculously (& with D’s persistence to try turning the key numerous times) the engine decided to play ball with us. When we got to Broadway, the market boys had been busy removing the snow off the pavement already! Ha! Good work! ~ Feeling uplifted by their spirit & seeing all the other traders who braved it out, I set up my stall. And from early on, big cakes were starting to be sold – Hm, maybe it’s not as bad as I feared?? But Tamami, learn, please, follow your instinct. You shouldn’t ‘ve come. For as yes, it’s started to snow HEAVILY & it’s way earlier than what the weatherman said. (Mister said it’ll hit the East around 3pm, but in reality it was 10:30am.) At first it was lovely in that ‘oh wow, this feels like a proper Xmas Market.’ kind of way. Everyone was smiling & enjoying the experience. After thirty minutes or so, the tarpaulin roof cover over us was sagging with the weight of so much snow. I saw fellow stall holders using a broom stick to shove the snow off it. Thinking, wow, what a great idea to foresee it caving in, I asked if he could broom my roof too. Soon as it happened, I regretted asking. – Just above my stall is where two sheets of tarpaulin connect, & with the force of the broom it separated like a flap & a load of snow was dumped on to one third of my table, yes, disastrously on to quite a number of tarts. “Oh £v<k.” (ps: so sorry for all the sign-hidden swear words in this post, like I said, I very rarely swear, but I like to portray it as how it really went…) The man with the broom profusely apologized, poor bloke, but it really wasn’t his fault, if anything it’s the stupid roof. I told him so & to not worry. But I think my facial expression must’ve been so awful looking, he walked away looking unconvinced of my words & ever so sorry. – It must’ve been because in my mind I was repeating ‘this..is..not..good.. this..is..crap..”. 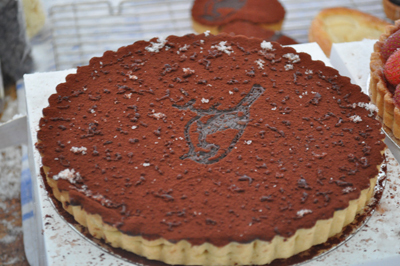 I quickly put all the affected tarts aside (which got given to fellow stall holders to consume – they didn’t mind) & got the market boys to fix together the roof. But aw gawd, what ever next? … What!? Gaaaaa!!!! The snow is now blowing INTO my stall!!! And not just a bit but big time! It’s going all over my things! Sa~ve me…. It took a while to figure out a solution (which was to buy cling-film & cover the goods). By that time more things were too damaged for selling on. Even the ones that were not directly hit by snow was also damaged as the moisture in the air was making the tart bases soggy to the touch. Might as well really, because to top it all off, the early heavy snow detracted visitors it seemed & the foot count was bad anyways. Later in the afternoon, I heard that the public transport had come to a halt & fellow stall holders started to talk of how on earth they’d be getting home. Some packed up early so they have a head start & obviously because they simply had enough of a bad day. 3pm, D telephones me. He can’t get the car to start up again. 3:10pm, the car finally starts but he now couldn’t roll it out of the parking position because there’s too much snow under the tyre, it’s slipping. 3:15pm, standing outside in gusty wind which felt like -6 degrees, I started my ‘end-of-day saaaaale….! !’ call. I think it’s the earliest I’ve ever done so. 4:20pm, D had only moved about 1.5 miles from our house due to extremely bad traffic. 4:45pm, pride shunt aside, I managed to sell almost everything except for two chocolate heart tarts. 4:50pm, but panic!!!!! D is still stuck in traffic & he’s going to be very late to pick me up. But the market finishes at 5pm…!! Do I stand by the side of the street with all my bags & wait?! 4:55pm, I then remembered that our friends D & L who lives near to the market dropped by earlier saying that if I ever needed help today they’d be around. I phoned them & within ten minutes they came rushing to my rescue… Friends like D & L…, are a God-send… THANK YOU. 5:20pm, in D & L’s warm house, feeling relieved but exhausted. I just couldn’t get over how lucky I am to have them as friends. L swiftly hands over a mug of hot mulled wine, orange slices an’ all. I’m so lucky… It could be because my cold body was getting back to normal temperature, but I felt a tad mushy. In my mind, I knew it was always going to be a gamble, the fact that the market day being a Friday instead of the usual Saturday. ~ Would it be busy or quiet? ~ I knew there’d be quite a number of people that had already traveled away to spend Christmas with their parents. But Broadway Market being loved by the locals, there’d always be shoppers too. I decided that this 24th for me would be about having fun & not stressing out on stuff not being sold. I wanted 24th to be plain-sailing, a nice finish for the year. So I didn’t make any lemon drizzle cakes, nor brownies & lemon tarts. Generally less all round, which was the right decision as the foot-count was great in the morning but trickled in the afternoon. Which infact suited me fine. I’ve already left my pride somewhere last week I think (!) as I felt so easy about calling out ‘saaale!!!’. … well besides, anything’s better than last week isn’t it – atleast it wasn’t snowing nor so windy. The market ended early at 3pm. Wishing “Merry Christmas” to so many people during the day ofcourse has a knock-on effect, & I’ve been feeling festive all the time, but it was when D with the two children came to pick me up that I truly felt festive & loosened up. Seeing them approaching the stall, all happy to see me, I vowed never to work on a silly day like the 24th, I really should’ve been with them. To somehow make-do with the time left, we went to sit at ‘Off Broadway’ (a café/ bar that is just a few steps away from my stall). The children drank hot apple juice (their favourite), I had red wine (my favourite), & D was coffee with milk on the side (his favourite non-alcoholic drink?!) as he was driving. It was a nice little moment there & I’m glad we did it. Oh I feel your pain – poor petal. I didn’t have the snow problem. The run up to Christmas was very difficult with -10C which is not good for chocolate!! People were nervous to travel into town to shop so even though the market went ahead it was quieter than expected :-( But there’s always 2011!! Happy New Year! I felt bad reading this post until I came to the point where you described how your family came to meet you at the market. I could just picture them with big smile on their faces. How sweet. You know they love you and support you. I wish you loads of good-sale days in this new year — sending you good thoughts! wow! the 18th sounded scary. as someone who has lived most of their life in areas which have winter weather, your instincts are right! when big snows head in, smart people stay in. sorry your sales were poorly—but enjoyed reading how the family came to get you on the 24th. Cocopuff1212, ooooh so sorry I didn’t mean to make you feel bad!! Thank you very much for your kind words about my family, very touching…!! Sorry to hear about the roof and the ruined cakes, glad you stay calm under the pressure. I might have fainted if i were you! One time I was at work alone and the oven caught fire, I think i must have just stood there and watched the fire for 10 seconds frozen to the spot and shocked! I was the only baker and had never experienced a fire. Someone had to wake me up from my daze! Hope that 2011 will be a very happy year for you! Alison – Thank you!! but I’m not sure wether I stayed calm…! Lol, I’m a person that may look it but in the inside, am angry, upset or swear-y! Your story about the oven – what a shocker!! What on earth caught fire in there? – I once did a similar thing when I tried to roast mixed nuts in an oven/ microwave machine, & it caught fire! Jessie – cheers darlin’ & a very happy new year to you too! May 2011 shine the brightest & bring you many fortunes! Wow, it sure was hard… but you came through all right; your telling your story proves it! Have a good rest and take it easy! I totally understand what you must have gone through. Horror touched attained its peak that day. But I (like all the others who have commented) send you tons of happy thoughts, support and a super year 2011. You deserve the best sale-days. I hope I get to come to your stall one day!! Good post! We all let a few #@#!!! words out under extreme provocation, very understandible. Sounds like even with all the weather difficulties, you still stayed as positive as you could do and had a good time with family and friends. A nice silver lining after dealing with the snow ! i love reading your thorough posts, tamami! looking at all that snow makes me wonder how i can even complain when it gets to the 50s in San Francisco. i wanted to share it with you! I had the same thing happen on my stall at Real Food Market on 18th. Cling film takes too much time to wrap around and it’s never wide enough. One tip (which I didn’t have to hand but have used for heavy rain) is to get one of those plastic dust sheets (using for painting). You’ll need an extra pair of hands to help clip it down around ur stall – it’s light and billowy but at least it will keep your goods dry. Hope we never experience that weather whilst trading again! I am currently having a 1 month Winter rest – but will be back regularly from this Saturday (29th)! I know, the transport to that market is a bit awkward isn’t it… There is a bus 394 from Angel that goes straight to the market though! – I hope the 15th didn’t deter you from coming to the market again… – I look forward to seeing you one day!!!!! What an eventful end of 2010! !